Ventilex Model VHE extract/supply valves are a new addition to the well established Ventilex range and continue the concept of elegant design combined with excellent performance characteristics. The valves are constructed from white epoxy finished steel and are supplied complete with a bayonet action fixing frame. This allows positive locking and sealing of the valve yet still enables, easy removal for adjustment or cleaning. The valve profile is designed to eliminate fouling of adjacent decorated surfaces - a feature common to all Ventilex valves. 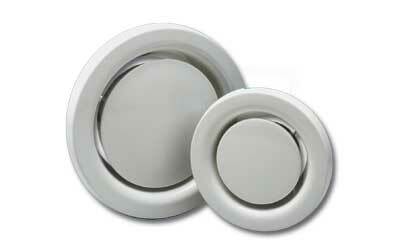 The central core is adjustable and offers a wide range of settings to meet specific system designs. Datum position is achieved when core face is level with face of valve (see dimensional diagram). Bathrooms, kitchens, toilets, lobby areas or any room requiring a single diffuser for up to 100m3/hr (multiple arrays can of course be utilised).